So, all the awarding bodies have a slightly different recommendations and also the training providers also have a recommendation so you’ll have guidelines within your learning achievement portfolio to outline everything that you need to know, but we’re going to go through these whole eight weeks, which is applicable for twelve weeks as well. So the first of these five steps is to make sure that you are truly aware of what your client’s goal is. Because if you know this very specifically (that means making it a SMART goal) you could very clearly put a tick in the box that the client has achieved that goal – then that’s going to make it so much easier when it comes to actually plan what you do session by session. So now you have the goals the step number two is to understand what the physiological adaptation you’re looking for along the way to get to. This eight week or twelve-week goal. The best way to do that is to divide it up in chunks. If you’ve got an eight week goal divide it into two chunks of four if you’ve got a 12 week goal divide it into three chunks of four. Now these chunks are called mesocycles but in this mesocycle just have a think about what physiological adaptation you would like your client to achieve by the end of each chunk, that systematically helps them achieve their goal in the end. For example I could say I want to focus on endurance training and endurance adaptation in this first four weeks and then focus on hypertrophy in the second four weeks, or I might have something whereby I want to focus on the distance that my client is going in the first four weeks (if they’ve got an event for a running goal) and then I could work on the speed that they’re gonna compete at, in the second mesocycle (lot of the four weeks). So when you look at it just think about how can you chunk this now in two sections if it’s a 8-week goal, three sections if it’s twelve-week goal. 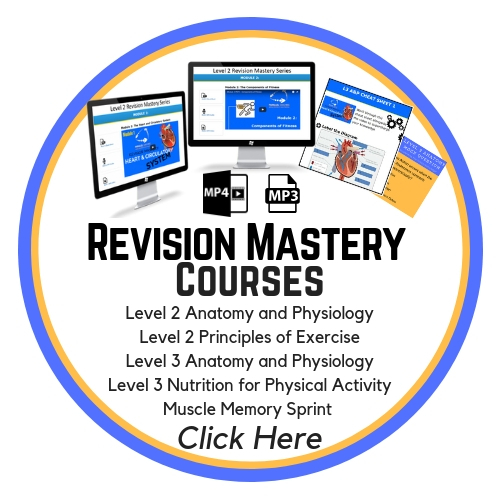 This will basically allow you to now have an understanding of what you need to aim towards so here I’ve got endurance and hypertrophy… in the endurance section, I know that I now want to focus towards type 1 muscle fibers and using aerobic energy system so this helps focus my planning for those first 4 weeks. If I’m looking for hypertrophy I know I want the type 2a muscle fibers and I also want to be targeting the lactic acid system as much as I possibly can. 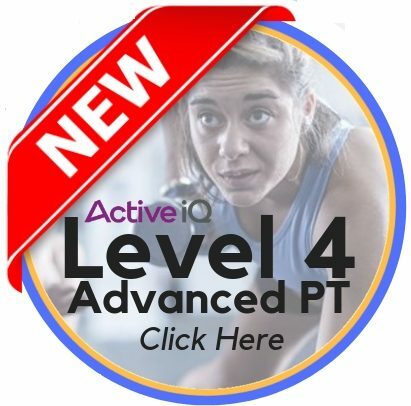 It gives you an idea of what physiological adaptation is required in each of the four weeks, within your Level 3 PT Overview of Progressive Predictive Plan. We’ve got the general progression that we’re looking for across the eight weeks now we’re going to break that down even further to understand the individual progressions – and in order to do that, I definitely advise you use the gas principle so the gas principle means general adaptation syndrome, so the general adaptation syndrome is related to building up the progression week on week with your client. So you make it harder each week… notice we do that for three weeks but on the fourth week we drop down which allows the adaptation to happen in the body for all of the demand we’ve already put on the body so that fourth week is an adaptation week so we reduce something in that week to make there more of a recovery and then we do that again so we progress for three weeks and then encourage more recovery on the fourth week. 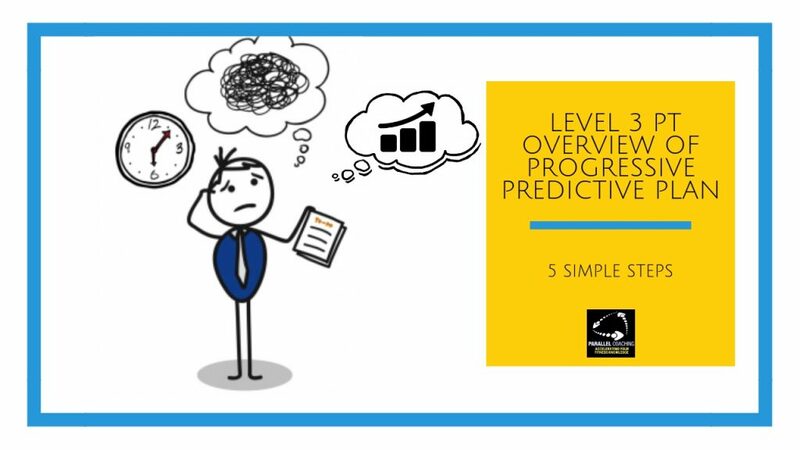 Your step three is to basically draw this gas principle out whereby it’s going up up up and then down, up up up and then down, and apply that across your 8-12 week Level 3 PT Overview of Progressive Predictive Plan Now. We’re going to show the set progression in each week so in order to do this we need to be aware of the fitt principle the frequency intensity time and type that our client is going to be training in each week and you need to do this for both CV and for resistance and the easiest way to do this is to do it on two separate grids. Draw one of these for CV and then another one for resistance training and then you want to detail the frequency intensity time and type that your client is gonna do for each of these weeks. We’re gonna look for a steady progression on the first three weeks and then bring it down a notch on the fourth week to resemble this gas principle that we’ve just drawn a quick example of. If I only go to the gym and do cardiovascular once a week in the first week, but then I want to go twice a week in the second week and then I’m gonna go twice a week on the third week and then drop down to just once a week on the fourth week. So you can progress the frequency and then drop it back down also you can progress the intensity and progress this along so that something changes in every single week and that’s the main way to show the progression from the beginning all the way across the end. At least one part of your frequency intensity time and type will change inside every single week. Once you’ve now detailed all of your frequency intensity time and type all the way down through for all eight weeks in your Level 3 PT Overview of Progressive Predictive Plan you can then pick which ones you would like to turn into a program card so for example you might pick week two whereby you take this frequency intensity time and type and use that into one of your program cards. Then you might pick week number seven where you use this frequency intensity time type for another program card. This is a way to stop you from going around and around in circles about what to actually put in your program card because now you’ve got the detail of how intense they need to be training and also the time they’re going to be training and the training type that they’re going to be doing in those sessions. It makes it laser-focused on what you need to include on every single program card. Also if you’d like to join us in our inner circle Facebook group it’s an exclusive group just for fitness professionals and those training to be fitness professionals. able to ask questions and get support. I look forward to seeing you in that group.